Lady of Rage [@TheOfficialRage], Yo Yo [@TheRealYoYo], MC Lyte [@MCLyte], Monie Love [@DaRealMonieLove] and MC Smooth [@SmoothTheMC], a.k.a. "The Legends," will be performing in Los Angeles, CA, on 12/22/2012. This upcoming three-day event is also being used as a platform to find the "NEXT FEMALE EMCEE," so in turn it'll be a great opportunity for any & all aspiring female rap artists who are looking for that big break! In addition, the "Ladies of Rap,"will be conducting a Legends Speak Panel, "Who Are They, Where Are They, What Happened and Why," on day two, with the series finally commencing on the 22nd with the stellar show hosted by Lil' Mama [@LilMama]. for more information re. 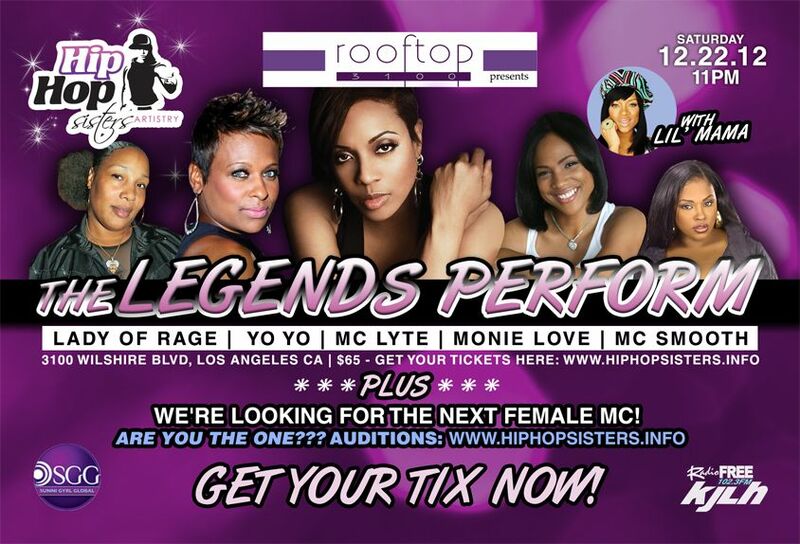 auditions and/or tickets, please go to: www.HipHopSisters.Info. thanks in advance for all of your love & support!